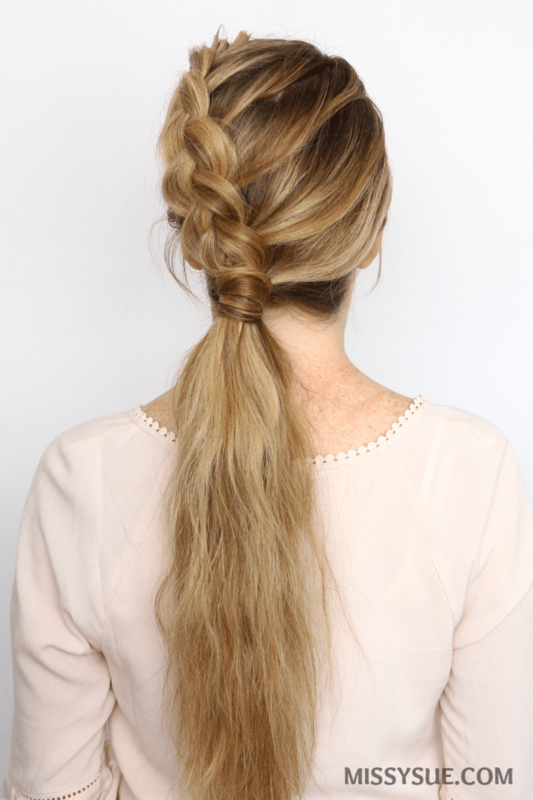 Who’s ready for some easy, heatless hairstyles? Summer is officially here and it’s hot out there! 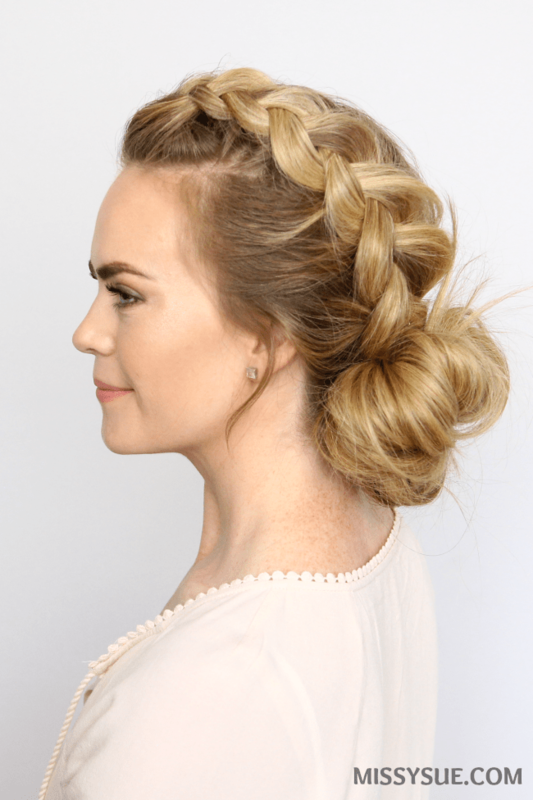 Put down those hot tools and give your hair a break with this mohawk dutch braid. This style is simple and quick and there are also 4 different ways to wear it. You now have a hairstyle for the next four days! Give it a try and let me know what you think! Step 1 / Start by parting the hair in a deep side part on the right side. Step 2 / Finger comb the hair straight back from the forehead and pick up three sections for the braid. Step 3 / Begin by crossing the left strand under the middle, then the right strand under the middle. Step 4 / Cross the left strand under the middle and then the right strand under the middle. Step 5 / Now begin incorporating hair into the braid so pick up a section along the part line and add it into the braid. Step 6 / Continue the dutch braid along the top of the head, following along the part line, until reaching the crown. Step 7 / When the braid reaches the crown, begin adding in hair from the right side of the part, working from the end of the part down towards the right ear so the hair sweeps around and across the back of the head. Step 8 / Continue bringing in sections until it reaches the nape of the neck, then braid to the bottom in a regular braid. Step 9 / Tie off the end of the braid with a clear elastic band and then go back and gently pull on the edges to make it wider and more full. Step 1 / Complete the previous steps for the mohawk side braid. Step 2 / Instead of braiding to the bottom of the hair, stop at the collar bone and divide off a small section from the outer edge. Step 3 / Wrap this section around the base of the braid and tie it off with an elastic band ensuring the ends from the wrapped section are included. Step 4 / Go back and gently pull on the edges of the braid as well as the wrapped section to make it fuller. Step 1 / Complete the previous steps above for the mohawk dutch braid. Step 2 / When the braid reaches the nape of the neck, tie it off with a hair band. Step 3 / Divide off a small section from the ponytail, wrapping it around the hair band. Step 4 / Secure it underneath with 1-2 bobby pins. Step 1 / Complete the mohawk dutch braid from the instructions above. Step 2 / At the nape of the neck, wrap the hair halfway through a hair band. Step 3 / Twist the hand underneath the hair and wrap the hair band back over the base. Step 4 / Pull on the sides of the bun to tighten it against the head. Step 5 / Take the ends sticking out, wrap them back towards the hair band, tucking them in. Step 6 / Pin down any loose pieces sticking out and set the style with hairspray. 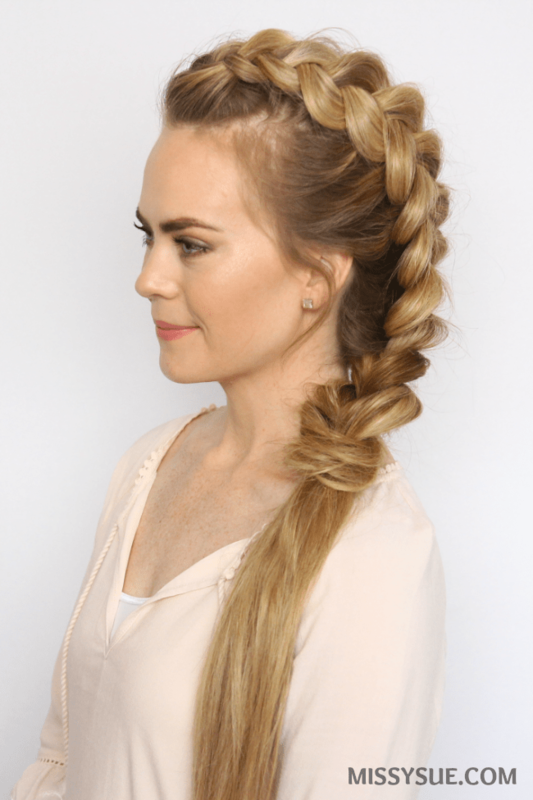 Are you using extensions with these braids? She has to be. Noones hair is naturally that thick. I love how they leave that major fact out almost ALL the time. Thats the thing about tutorials,they never tell you everything.